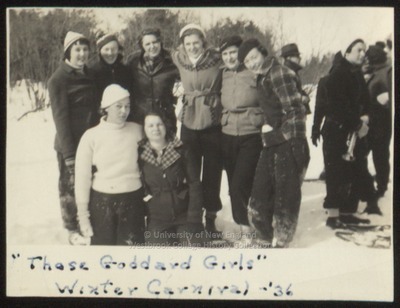 Eight Westbrook Junior College girls (six in the back row, two kneeling in the front row) stand/kneel on the ice in this black & white candid snapshot with "'Those Goddard Girls' Winter Carnival --'36" written on the front. On the back is written: "Gross, Palmer, Cunningham, Cole, Moore, Bev ? , Savage & Craig." The eight girls wear snow pants with their leg bottoms tucked into socks and boots, snowsuit jackets or heavy sweaters, and hats and mittens. To their left are two other girls with a pair of snowshoes on the ground in front of them.